John Andrew Smoltz (born May 15, 1967), nicknamed "Smoltzie" and "Marmaduke," is an American former baseball pitcher who played 22 seasons in Major League Baseball from 1988 to 2009, all but the last year with the Atlanta Braves. An eight-time All-Star, Smoltz was one of a celebrated trio of starting pitchers, along with Greg Maddux and Tom Glavine, who propelled Atlanta to perennial pennant contention in the 1990s, highlighted by a championship in the 1995 World Series. He won the National League (NL) Cy Young Award in 1996 after posting a record of 24–8, equaling the most victories by an NL pitcher since 1972. Though predominantly known as a starter, Smoltz was converted to a reliever in 2001 following his recovery from Tommy John surgery, and spent four years as the team's closer before returning to a starting role. In 2002, he set the NL record with 55 saves, and became only the second pitcher in history (joining Dennis Eckersley) to record both a 20-win season and a 50-save season. He is the only pitcher in major league history to record both 200 wins and 150 saves. John Smoltz was an All-State baseball and football player at Waverly High School in Lansing, Michigan before the Detroit Tigers selected him in the 22nd round of the 1985 amateur draft. He was the 574th selection of the draft. Smoltz played initially for the Class A Lakeland Tigers minor league team, and then moved on to the Class AA Glens Falls Tigers in 1987, posting disappointing records of 7–8 and 4–10. On August 12, 1987, he was traded to the Atlanta Braves where he played on their Class AAA Richmond Braves. The 1987 Tigers were in a three-team race, chasing the Toronto Blue Jays for the AL East division lead; in need of pitching help, Detroit sent their 20-year-old prospect to the Braves for the 36-year-old veteran Doyle Alexander. While Alexander did help the Tigers overtake the Blue Jays for the division title, he was out of baseball by 1989. Smoltz, on the other hand, became one of the cornerstones of the Braves franchise for the next two decades. Before the 1993 season, the Braves signed renowned control pitcher Greg Maddux, completing – along with Smoltz and Glavine – what many consider to be the most accomplished starting trio ever assembled on a single major league team. Smoltz again won fifteen games, but suffered his first postseason loss to the Philadelphia Phillies in the NLCS despite not allowing an earned run. After three years as one of baseball's most dominating closers, the team's management agreed to return Smoltz to the starting rotation prior to the 2005 season. His renewed career as a starter began inauspiciously. He allowed six earned runs in only 1 2⁄3 innings—matching the shortest starts of his career—as the Braves were blown out on Opening Day by the Marlins. Poor run support contributed to an 0–3 start despite stronger pitching performances by Smoltz. After these initial difficulties, though, things fell into place. 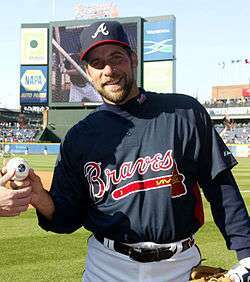 At the All-Star break, Smoltz was 9–5 with an ERA of 2.68 and was chosen for the 2005 NL All-Star team. Smoltz gave up a solo home run to Miguel Tejada in the second inning of the American League's 7–5 victory and was charged with the loss. For his career, he was 1–2 in All-Star games, putting him in a tie for the most losses. 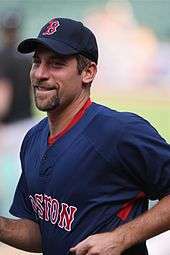 In December 2008, several members of the Boston Red Sox organization, including pitching coach John Farrell, vice president of player personnel Ben Cherington, and assistant trainer Mike Reinold, flew to Atlanta to participate in a 90-minute workout with Smoltz. Throwing for only the second time since having surgery on a torn labrum in his pitching shoulder, he threw a 50-pitch side session and showcased not only his tremendous progress since the surgery, but an arsenal of well-developed pitches which made him so successful throughout his career. He impressed the Red Sox enough during the workout that less than a month later, a one-year contract was offered by the organization. In 2008 and 2010, Smoltz served as a color analyst alongside Joe Simpson for Braves games on Peachtree TV. Nationally, Smoltz has been an analyst for MLB Network and called regular season and postseason games for TBS. In 2014, he was hired by Fox Sports as a game analyst. He will be paired with Matt Vasgersian and call games in the No.2 booth. He has also joined Fox Sports South and SportSouth to be an analyst for select Braves games during the 2014 season. Smoltz will replace Harold Reynolds and Tom Verducci, his colleagues from MLB Network, as the lead analyst for Major League Baseball on Fox for the 2016 season, teaming up with Joe Buck. Smoltz met his first wife Dyan Struble at the Omni Hotel in downtown Atlanta; the couple had four children before divorcing in 2007 after 16 years of marriage. Smoltz lives in Alpharetta, Georgia and also has a home at Sea Island, a golf resort. On May 16, 2009, Smoltz married the former Kathryn Darden at his home with 70 friends and family in attendance. Smoltz is a Christian..
Smoltz is a good friend of professional golfer Tiger Woods; the two often golf together. Woods has stated that Smoltz is the best golfer outside of the PGA Tour that he has observed. Smoltz has stated that he once had a plus 4 handicap. He is also involved in the sport of bowling. Smoltz counts Doc Rivers as a personal friend dating back to Rivers' playing days in Atlanta. In the edition of January 12, 2008 of the Boston Globe, Rivers is quoted as saying, "I offered him my apartment... I just told him about Terry and the Red Sox organization. I told him it's a no-brainer." Smoltz is a distant cousin of baseball Hall of Famer Charlie Gehringer. Smoltz produced an automated campaign phone recording on behalf of the candidacy of Ralph E. Reed, Jr. for Lieutenant Governor of Georgia during the 2006 primary. It was speculated that Smoltz would run for Congress in 2010 as a Republican candidate to fill the departing John Linder's seat in Georgia's 7th congressional district. 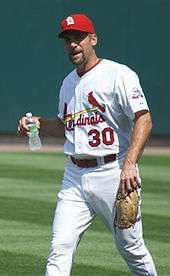 Smoltz is the Atlanta host for Big League Impact, an eight-city fantasy football network created and led by longtime Cardinals pitcher and former teammate Adam Wainwright. In 2015, the organization raised more than $1 million total for various charitable organizations. ↑ "John Smoltz inspires Milton youth baseball team". northfulton.com. Retrieved January 24, 2014. ↑ "1985 MLB Draft History – Round 22". Mymlbdraft.com. Retrieved October 19, 2010. ↑ Porter, David L. 2000. "John Smoltz" in The Biographical Dictionary of American Sports, 1440–1441. Westport, Connecticut: Greenwood Publishing Group. 1 2 Whiteside, Larry (October 1996). "Braves' John Smoltz Makes A Pitch for Cy Young Award". Baseball Digest. Vol. 55 no. 10. United States: Lakeside Publishing Co. pp. 22–25. ISSN 0005-609X. Retrieved June 22, 2010. ↑ Kuenster, John (July 2000). "Without John Smoltz, Braves May Be Pressed To Set New Winning Record". Baseball Digest. Vol. 59 no. 7. United States: Lakeside Publishing Co. p. 17. ISSN 0005-609X. Retrieved June 22, 2010. ↑ Bowman, Mark (April 26, 2007). "Braves give Smoltz an extension: Veteran almost certain to finish legendary career in Atlanta". MLB.com. ↑ Bowman, Mark (May 24, 2007). "The Official Site of The Atlanta Braves: News: Game Wrapup". Atlanta.braves.mlb.com. Retrieved October 19, 2010. ↑ The Associated Press (April 30, 2008). "Smoltz Put on Disabled List With Sore Right Shoulder". New York Times. ↑ Bradford, Rob "How John Smoltz Convinced The Red Sox He Was Worth A Chance" Retrieved from WEEI.com on January 28, 2009. ↑ "Red Sox sign free agent righthanded pitcher John Smoltz to one-year contract". Boston Red Sox. MLB. Retrieved October 19, 2010. ↑ "Smoltz to Red Sox; Baldelli, Penny will join him". Sports.yahoo.com. Archived from the original on June 17, 2009. Retrieved October 19, 2010. ↑ "Smoltz designated for assignment". Boston.com. August 7, 2009. Retrieved October 19, 2010. ↑ "Smoltz won't go to Boston bullpen, time with Sox likely done". Soxblog.projo.com. Archived from the original on July 15, 2011. Retrieved October 19, 2010. ↑ Jon Paul Morosi (August 17, 2009). "Red Sox officially release former Cy Young winner". Fox Sports. Archived from the original on August 19, 2009. Retrieved August 17, 2009. ↑ "St. Louis Cardinals vs. San Diego Padres – Recap – August 23, 2009 – ESPN". Sports.espn.go.com. August 23, 2009. Retrieved October 19, 2010. ↑ "2009 NLDS Game 3". ESPN. ESPN. ↑ Bowman, Mark (April 16, 2012). "Braves to honor Smoltz by retiring No. 29". MLB.com. Retrieved June 9, 2012. ↑ Rogers, Carroll (June 8, 2012). "Smoltz calls No. 29 retirement coolest moment of his life". The Atlanta Journal-Constitution. Archived from the original on June 10, 2012. Retrieved June 9, 2012. ↑ John Smoltz joins TBS as an analyst. Associated Press. March 16, 2010. ↑ Best, Neil (March 10, 2014). "John Smoltz joins Fox's MLB roster". Newsday. Retrieved March 10, 2014. ↑ Schilken, Chuck (December 22, 2015). "John Smoltz to replace Tom Verducci and Harold Reynolds during Fox's baseball coverage". LA Times. Retrieved February 8, 2016. ↑ "John Smoltz: A Hall Of Fame Tribute". ESPN. ESPN. ↑ Bowman, Mark (February 9, 2007). "Smoltz, wife to end 16-year marriage". MLB.com. ↑ Official Website for Tiger Woods Archived November 12, 2006, at the Wayback Machine. ↑ "John Smoltz For Congress?". Yardbarker.com. Archived from the original on March 4, 2010. Retrieved October 19, 2010. ↑ Iyer, Vinnie (August 5, 2016). "Adam Wainwright is a true ace — when it comes to fantasy football". The Sporting News. Retrieved August 6, 2016. ↑ "ESPN – Smoltz wins Branch Rickey Award – MLB". Sports.espn.go.com. September 25, 2007. Retrieved October 19, 2010. ↑ SluggerWV (April 18, 2008). "Slugger's Tales from the Rails: Big night for Chipper, Smoltz, and the Braves". Sluggerwv.blogspot.com. Retrieved October 19, 2010. 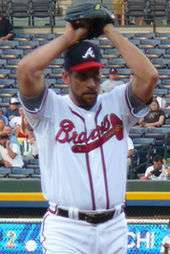 Wikimedia Commons has media related to John Smoltz.